1. 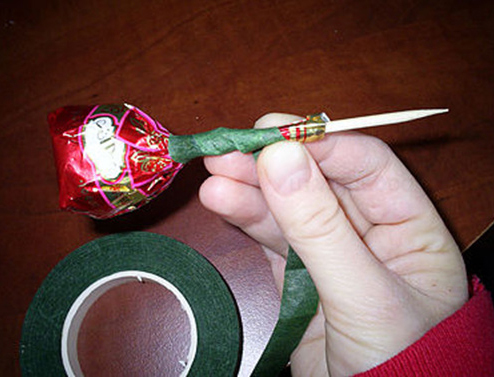 First, take a candy, a little unwind wrapper, insert a toothpick and wrap wrapper around the toothpick. do so with all the candies. 2. 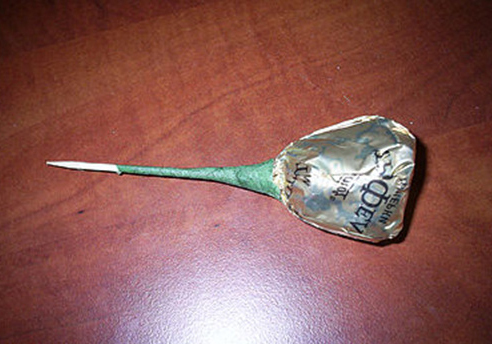 Next we begin to create a stalk for our candy-flower. Take tape tape and wind it to our “stalk”, but not to the end. Leave intact about 2 centimeters from the bottom of the toothpick. 3. Now we begin to create the heart. 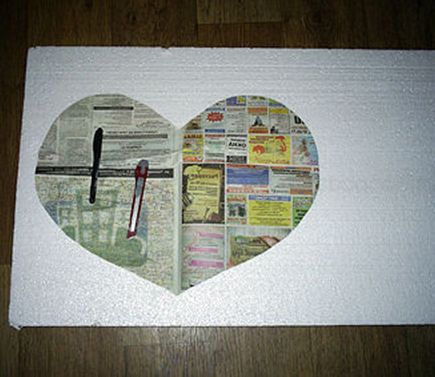 We take the newspaper paper and cut out the heart from it. Then transfer the template to the foam and use the office knife to cut the heart. 4. Pasted the edges of our heart from styrofoam with two-sided scotch. 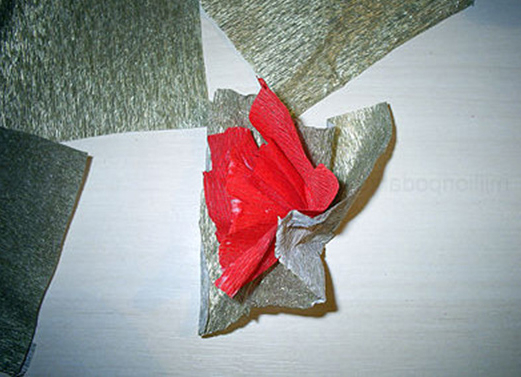 Then we take the red corrugated paper, cut out of it a strip, make on it folds and glue on edges, around a heart. 5. For decoration we will need flowers. To create them, take corrugated paper of two colors, cut squares of the same size and compress them in the middle (see the picture). Fasten the resulting flower, taping the squares together. 6. 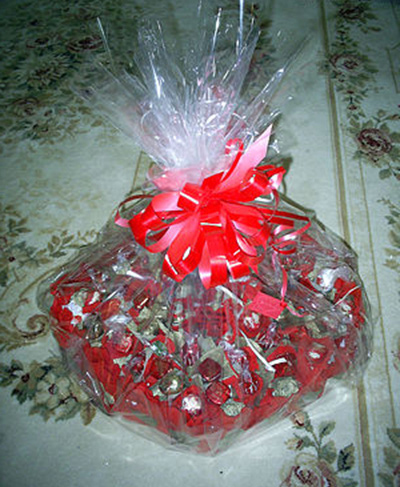 The received flowers put on candies with toothpicks. 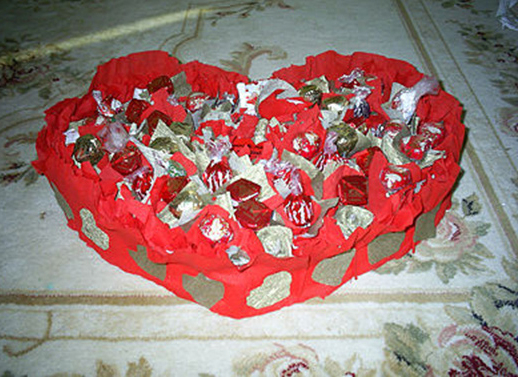 Tightly stick all candies on our billet in the form of a heart. You can also attach flowers between the candies. The edges of the crafts can be decorated with hearts. For beauty, the top edge of the red strip of paper, you can create waves. 7. 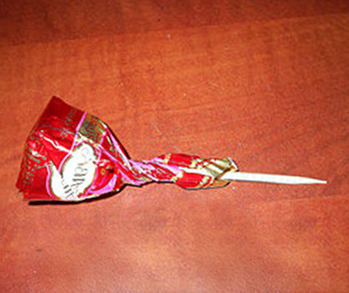 Gently candy our heart in the middle of the wrapping film, lift the edges of the film to the top and tie the top of the cooked bow. 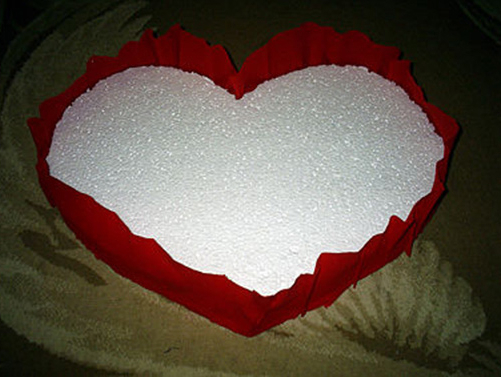 A gift of sweets in the form of a heart is ready. Now it is left to give it to the dear person.